1:48 I'm not making a second trade. Thanks for coming. No clinic next week due to 4th. See you in two weeks. Take some courses. take 9 and pour the wine. not be broken until the move is over. 1:09 I have placed a Face of God chart in the CCT room. It suggests we reach 2082. It shows the energy center point that turned prices down. 12:50 the real sell time was right on the 11:28 Tide time; I just dis not see enough juice to get me interested. and the actions of the EXMAs changed that. 11:37 one really wants to stay out of congestions. 11:21 the short term Fractal Efficiency tends to follow XTide. 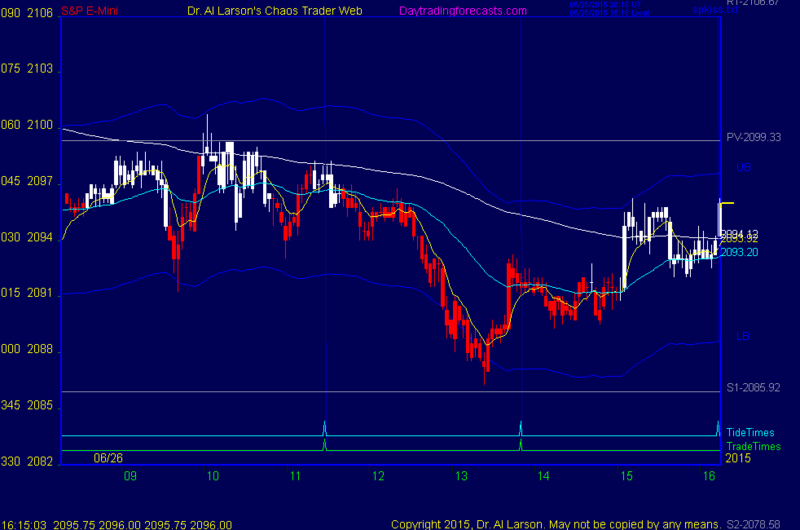 This is shown on the SP CTME chart. If you are a Certified Chaos Trader, you have a link to this chart on the right side of the List Of Charts page. short term energy flow. The swings have basically been following it. 10:50 prices are trading both sides of the 110; this means stay out. tutorial and Hex Wheels today, linked on the rifht side of the List Of charts page. 10:14 setting inside the range of the day. May stay there all day . 10:01 rally broke above the 440 minut EXMA, and above the privot price. It has now moved a harmonic 9 points. 9:58 on the MTRAinbow chart, you see three slightly lower lows. Traders call this "Three drives to a bottom." This pattern usually means a low is in. will follow immediately. We could spend the whole day trading inside the range. do yourself a huge favor and buy and read the book "Flash Boys." 9:34 today is the continuation of a down trend that started on the 22nd. It is late in that move, so prices are probing for a bottom. 6/26/2015 12:05:51 PM MT bbb****:: Great stuff. Looking forward to seeing the next evolution. Have a great weekend and holiday next week. 6/26/2015 11:59:16 AM MT Al****:: I'm working on a total package. We can plot any external data file on a Ninja Chart already. I'm also planning to modify my EPMAP course to teach the basics of using the flux lines. A lot of work to do, but getting my stuff into NinjaTrader will let me teach my stuff 10000 % better. 6/26/2015 11:54:25 AM MT bbb****:: And I assume one can choose which ones to show in the chart? You think you will ever sell the moon tides for ninja so that they actually show on the chart? I mean not just the times but the actual tides? 6/26/2015 11:44:59 AM MT bbb****:: Hi Al- when do you think the flux lines for ninja will be ready? It's he same function that is available in wave59 right? But I would rather use yours on ninja. Great stuff!